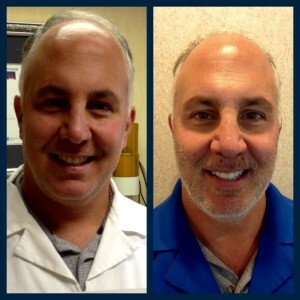 As promised, above is a side by side photo of Dr. Courey at day 1 and day 10. Dr. James Courey of Manalapan NJ has joined the "No Shave November" initiative to bring awareness to the needs of adults with autism. He will not shave, AT ALL, for the entire month of November! Feel free to "get personal" and ask Dr. Courey about his son Michael, and needs of people with autism. "My motivation is my son, Michael who is 16 years old and has autism. I hope to use the power of my facial hair to have an impact on the face of the future of adults with autism. In NJ, there are few options for adults with autism. PCDI, a program in Princeton, is expanding their Adult Life Skills Program to nurture, and support adults with autism. " Visit www.pcdi.org to make a donation. You can help support his efforts with a donation to PCDI, a program in Princeton, NJ, dedicated to serving the vast needs of people with autism.